So as things tend to happen, I have acquired quite a few paint chips in my front end, but the problem is, I have molten orange as my color, and that seems like it would be a hard paint color to fix, so I was wondering if anybody has found a good way of fixing paint chips in Molten Orange? is there a fix-it-stick of sorts, or does the ford dealer do any kind of fixes? It is a 2016. I feel your pain, but have managed to find a decent solution. I initially wanted to just order a paint chip kit like Langka, Dr.Colorchip or Chipfixx but they all had disclaimers about color matching tri coats as kind of hit and miss. So i decided to just get a paint pen right from Ford to guarantee a color match. Basically, in order to blend the new paint into the existing OEM paint you need a 'leveling solution' that flattens out the paint in the chip but does not disturb the OEM clear coat. I came across a DIY guide on how to make a leveling solution, and its super simple. Mix 3 parts of this with 7 parts of micro polish (30/70 mixture). You can use any mixture you want but using some micro polish to cut the brush cleaner is probably a good idea so you're not stripping all the paint out. So get a paint pen from Ford for a guaranteed color match, fill in your chips, and then use the leveling solution to flatten it out. Using a T-shirt over a straight edge like a credit card works well to get it nice and level. I'll be sure to add that to my wishlist so I don't forget it. Thanks for the info! Bringing this back from dead. 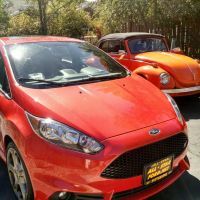 I've got a '14 Molten Orange with TONS of rock chips. Got the Dr. Colorchip kit for Molten Orange this week and the paint is a very good match. Chips are much less noticeable although I need to do more work to "level" the chips.